by Bill Walsh, Article donated by the mane points horse resource center. While she almost never had to pay full fare, trading work for part of the board, Cobie Ellington parted with a fair share of greenbacks in support of her equine habit over the years. When she and her husband Larry purchased land just outside Mount Pleasant, N.C., four years ago, deciding to build a barn and keeping the horses at home was easy. What kind of barn to build was a bit more challenging. "We thought about a wooden barn and we though about building it ourselves," Ellington says. "Wood is expensive. One of my favorite barns has a metal roof with back-to-back block stalls down the center. I looked into that and talked with some people about doing it. With a block barn, I was going to have to get involved with two or three contractors-finding someone to lay the block, someone to do the roof and so on. That's when I decided I just wanted someone to get it done, and they could call me when it was finished." Three of Ellington's five horses live on the property, along with two ponies. Shelter from the storm is provided by her relatively new metal barn, a structure purchased from Jack Walters & Sons, Corp. It has four 12' x 12' stalls, a smaller pony stall, room for hay storage and tack. "The Walters rep came out and talked with me about what I wanted to do, and I just liked him instantly," Ellington recalls. "A metal building is a metal building is a metal building," she adds, comparing it to the commercial playground equipment business she runs from her home. "I was comfortable with the sales rep, I was comfortable with the product, I was comfortable with the company," she says of her decision to go with Walters. "I felt that if Southern States had gotten hooked up with them, they couldn't be a bunch of bad guys. Southern States is a company that I have a lot of trust in through my years in dealing with horses." Ellington's is a 36' x 48' pole building with a galvanized steel shell. "There are 6' by 6's that went into the ground first, then the trusses went on, then the roof and the sides," she explains. "We did the interior; my husband built all the stalls. They are very much like the box stalls that Walters sells with these units." Leaving the exterior metal construction to the experts was probably a good idea. The pole-type construction is easier than the steel buildings that bolt to a slab; a design that uses trusses rather than I-beams is also easier to work with. Easy is a relative term. "The setting of poles is critical," Allen Nicholls says, "as far as getting the right depth and getting on solid ground. Also, the layout, the spacing of poles is critical." Where metal is involved, exactitude is everything. "When we first started doing metal buildings," the Front Royal, Va., building contractor says, "I thought we could do some of this ourselves. But wood is different from steel, and with steel you have to be right on the money. With wood, you can take a hammer and knock it over a little bit, do this and do that. We quickly learned to leave the steel to the steel experts." Needing a barn? "Look into this possibility," Ellington counsels. "Investigate all the options, but economic-wise and long-term as far as the warranties and durability are concerned, this is hard to beat. It looks good, and it's safe. "We've had some nasty weather since it's been up, and it is just as good as it was the first day we put the horses in. It definitely was a good way for me to spend my money. It's a nice barn, and it's going to be a nice barn 10 years from now, 15 years." To be sure, you can spend more, and easily, "but the bottom line is good horsekeeping," Ellington insists. "I wasn't into mahogany walls and fancy doors and fancy door locks; I just wanted a good, safe barn. I've been in a lot of barns that have bells and whistles that don't have anything to do with good horsekeeping." Bill Walsh is executive editor of The Mane Points. Four-x four-inch cotton gauze squares. Cotton gauze wraps, three or four inches wide. These can be purchased from your veterinarian or local pharmacy. The cotton squares are used for cleaning cuts and scrapes and can also be used for packing bleeding cuts or as pressure underneath a surface wrap. Use self-locking bags to keep opened packs of gauze clean and dry. Cotton sheet leg wraps. These are very thin cotton wraps used as the first layer of a standard leg wrap. Usually, four sheets are rolled together and applied to the leg, then a tighter gauze or elastic wrap is applied. The cotton sheets provide support and cushion. Flannel wraps. Thick cushion wraps with hood and loop closures can replace the thin cotton sheets and provide support under a leg wrap. Occasionally you will need to wrap a knee or hock and the associated lower leg, thus six are recommended. Vet wrap, Coflex, Flexus, or Elasticon. These products are usually the last layer of a leg wrap and provide support and compression. Elasticon is the strongest and works well holding bandages in place or closing the tops and bottoms of leg wraps to keep debris out. Cold packs. This can be as high-tech as refrigerated equine boots, or as simple as a bag of frozen peas. The semi-thawed pea bag conforms to the sore leg and can be held in place with gauze and vet wrap. The more expensive items come with straps and wraps. Duct tape. Duct tape is great for foot wraps; it's inexpensive, water-resistant and can be molded to fit the hoof. Thermometer. It is essential to have a plastic digital thermometer in your kit. Normal temperature for horses is 99.5 to 101.5 degrees. Stethoscope. These are inexpensive and can be used to determine intestinal sounds in cases of colic. Ask your vet to explain what to listen for. Scissors. Small, for suture removal. Forceps. These can be purchased through a veterinarian and used to remove objects from cuts or punctures. Forceps can be cleaned with alcohol between uses. Flashlight. A large beam light, a small penlight and spare batteries. Pliers and wire cutters. Many times cuts or punctures involve fence or other wire items. A fencer's tool that combines a wire cutter, hammer and pliers is best. Splint material. PVC pipe one to two feet long, cut and split lengthwise. This is used on the top of a leg wrap to support a leg in the event of severe tendon strain or a fracture. Don't try this for the first time in an emergency situation-practice putting the PVC splint on a quiet, healthy horse first, and have your veterinarian help you. Wound scrub. Iodine, Betadine or Nolvasan. Poultice. There are a number of excellent poultices available through your veterinarian or farm supply store. Plastic or brown paper wrap. Used as a wrap over a leg poultice. Epsom salts. Used as a foot soak for abscess other hoof pain. Clinch cutter and shoe puller. Every horse owner should learn the proper way to remove a shoe. If a shoe gets loose and twisted, proper and early removal will protect the hoof wall. Ask your farrier or veterinarian for assistance in learning this. Syringes. Three cc for tetanus and tranquilizer, 10 to 12 cc for pain reliever, 20 and 35 cc for Dipyrone for colic pain relief, 60 cc for flushing and clean-ing wounds or for oral administration. Use 20- and 14-gauge needles. 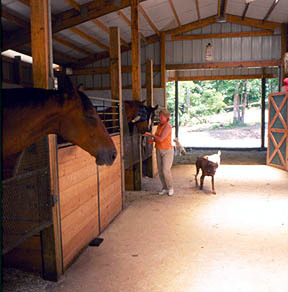 Read the next horse barns article on Farm Insurance.